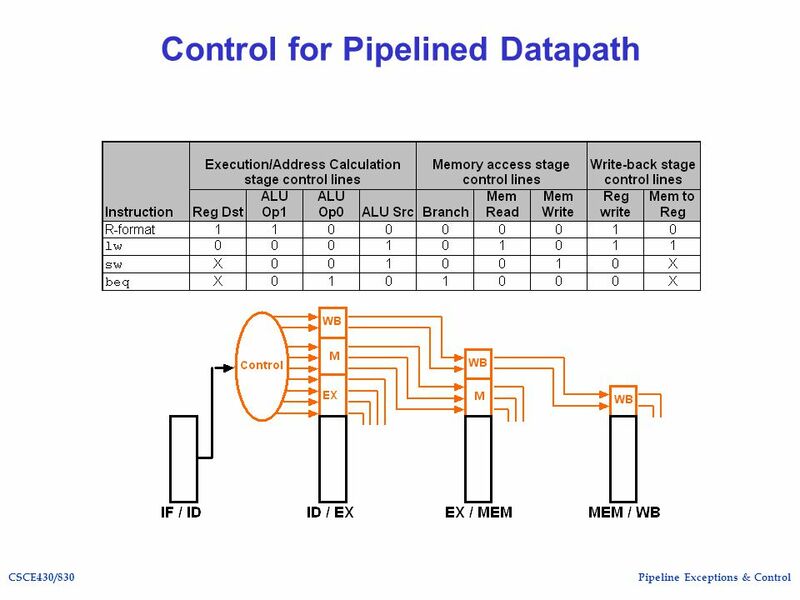 12 Pipeline Exceptions & ControlCSCE430/830 Class Exercise Consider the following code segment 1. LW R1, 0(R4) 2. LW R2, 0(R5) 3. ADD R3, R1, R2 4. BNZ R3, L 5. LW R4, 100(R1) 6. LW R5, 100(R2) 7. 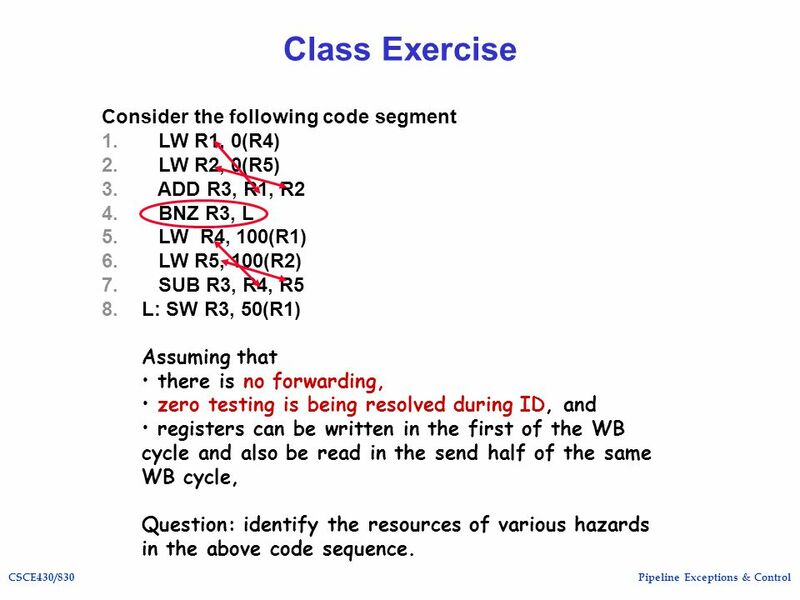 SUB R3, R4, R5 8.L: SW R3, 50(R1) Assuming that there is no forwarding, zero testing is being resolved during ID, and registers can be written in the first half of the WB cycle and also be read in the send half of the same WB cycle, Question: identify the resources of various hazards in the above code sequence. 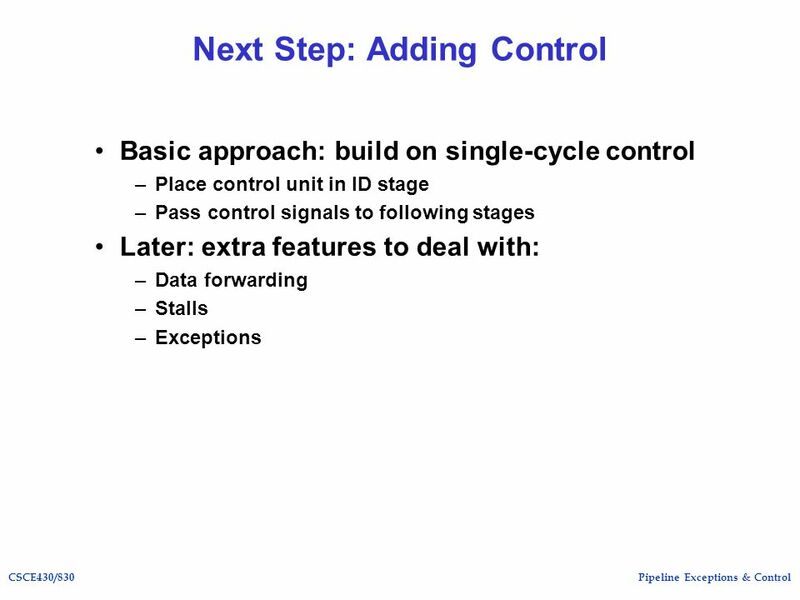 13 Pipeline Exceptions & ControlCSCE430/830 Class Exercise Consider the following code segment 1. LW R1, 0(R4) 2. LW R2, 0(R5) 3. ADD R3, R1, R2 4. BNZ R3, L 5. LW R4, 100(R1) 6. LW R5, 100(R2) 7. 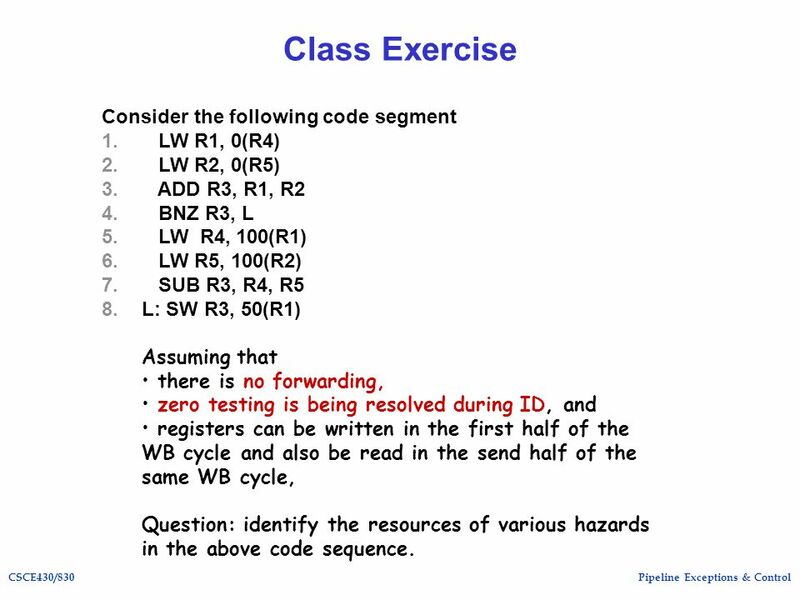 SUB R3, R4, R5 8.L: SW R3, 50(R1) Assuming that there is no forwarding, zero testing is being resolved during ID, and registers can be written in the first of the WB cycle and also be read in the send half of the same WB cycle, Question: identify the resources of various hazards in the above code sequence. 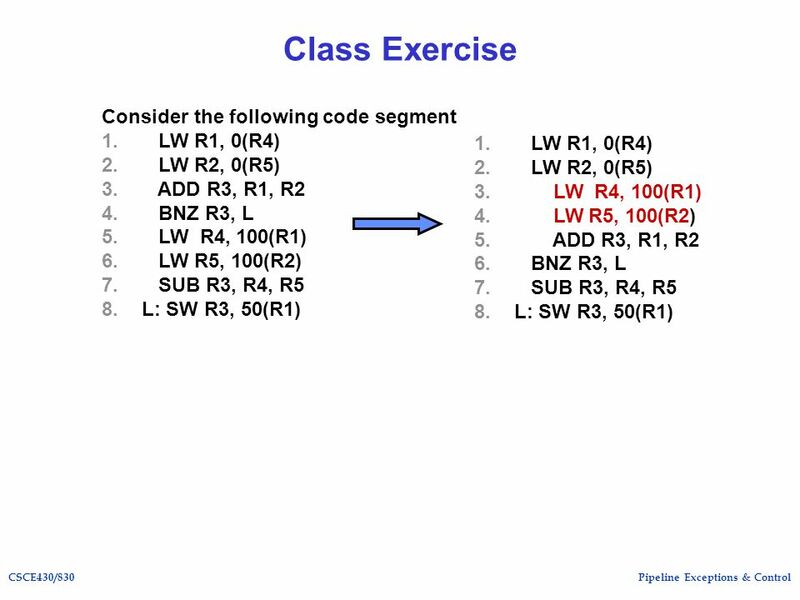 14 Pipeline Exceptions & ControlCSCE430/830 Class Exercise Consider the following code segment 1. LW R1, 0(R4) 2. LW R2, 0(R5) 3. ADD R3, R1, R2 4. BNZ R3, L 5. LW R4, 100(R1) 6. LW R5, 100(R2) 7. 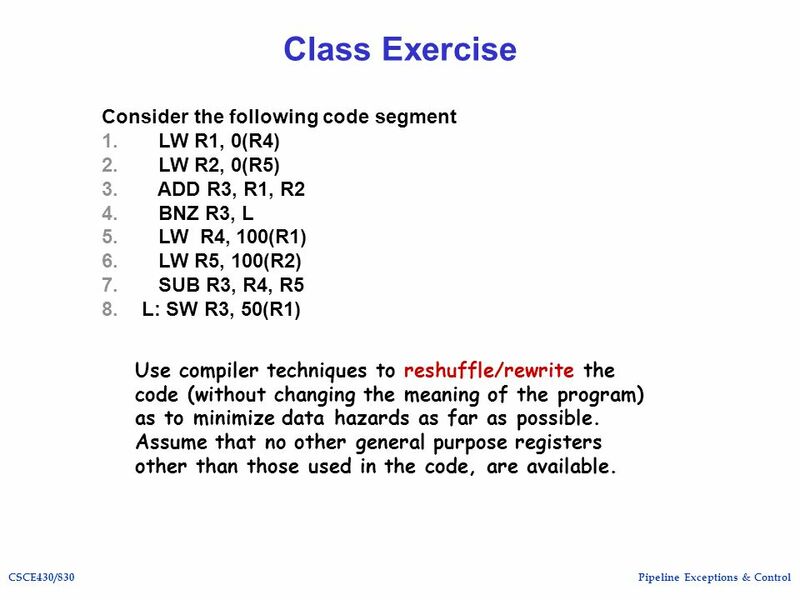 SUB R3, R4, R5 8.L: SW R3, 50(R1) Use compiler techniques to reshuffle/rewrite the code (without changing the meaning of the program) as to minimize data hazards as far as possible. Assume that no other general purpose registers other than those used in the code, are available. 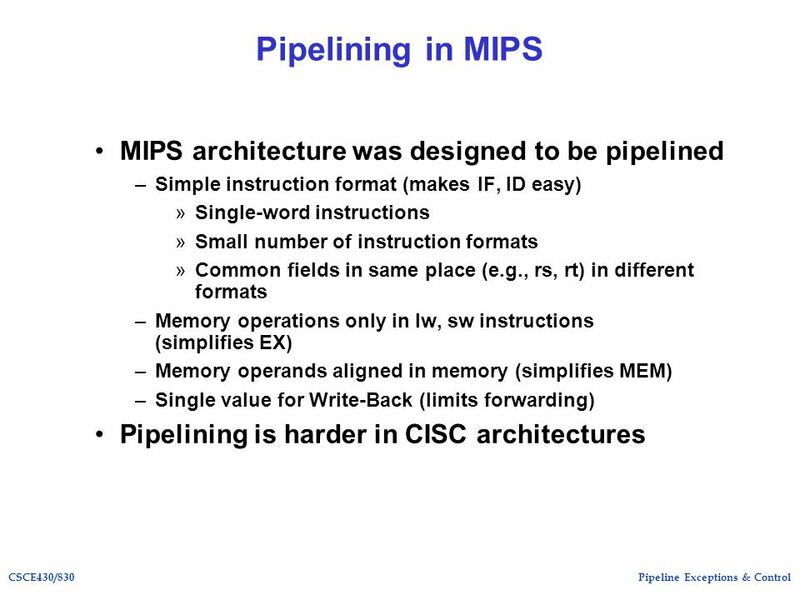 Download ppt "Pipeline Exceptions & ControlCSCE430/830 Pipelining in MIPS MIPS architecture was designed to be pipelined –Simple instruction format (makes IF, ID easy)"
Pipeline Example: cycle 1 lw R10,9(R1) sub R11,R2, R3 and R12,R4, R5 or R13,R6, R7. CML CML CS 230: Computer Organization and Assembly Language Aviral Shrivastava Department of Computer Science and Engineering School of Computing and Informatics. 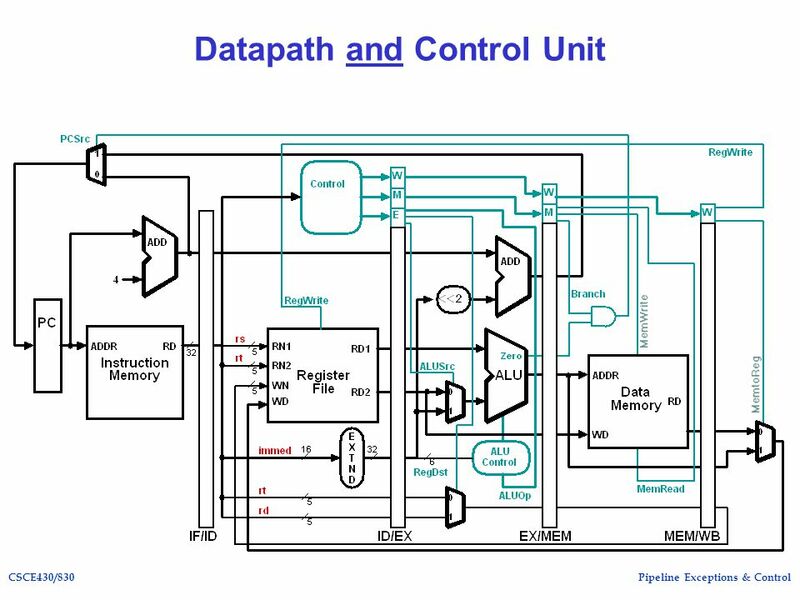 1 Datapath and Control (Multicycle datapath) CDA 3101 Discussion Section 11. 1 A few words about the quiz Closed book, but you may bring in a page of handwritten notes. 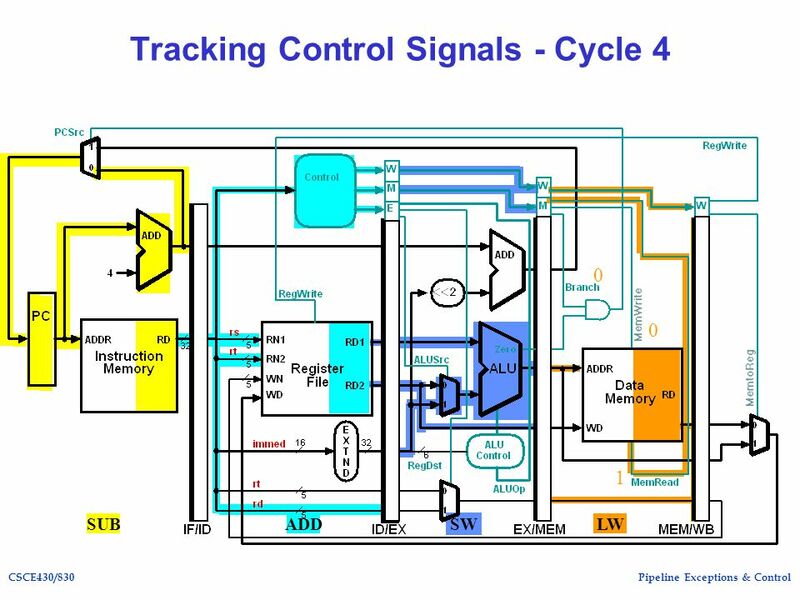 –You need to know what the “core” MIPS instructions do. –I. 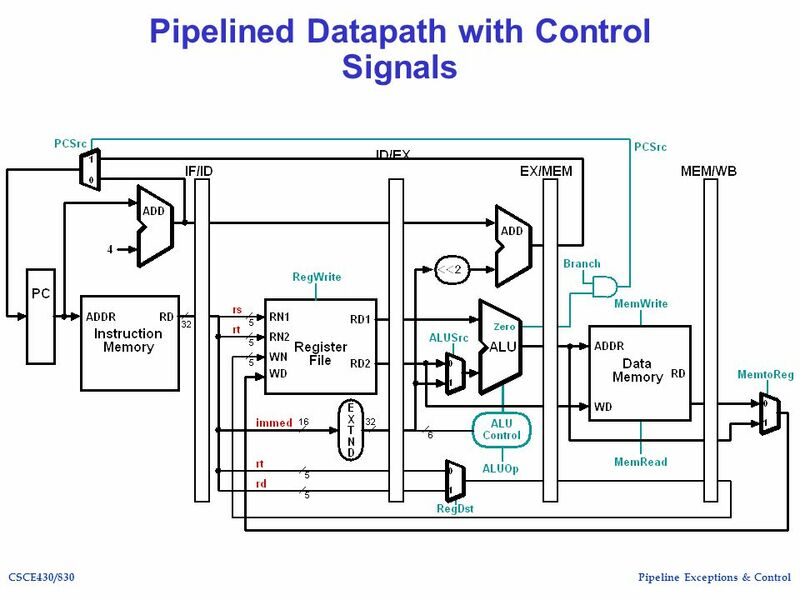 Prof. John Nestor ECE Department Lafayette College Easton, Pennsylvania ECE Computer Organization Pipelined Processor. 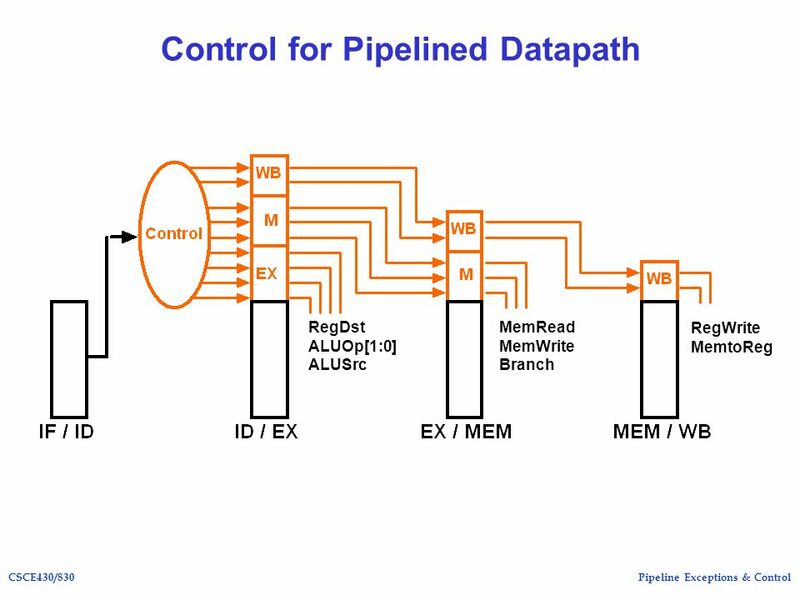 1  1998 Morgan Kaufmann Publishers Chapter Six Enhancing Performance with Pipelining. 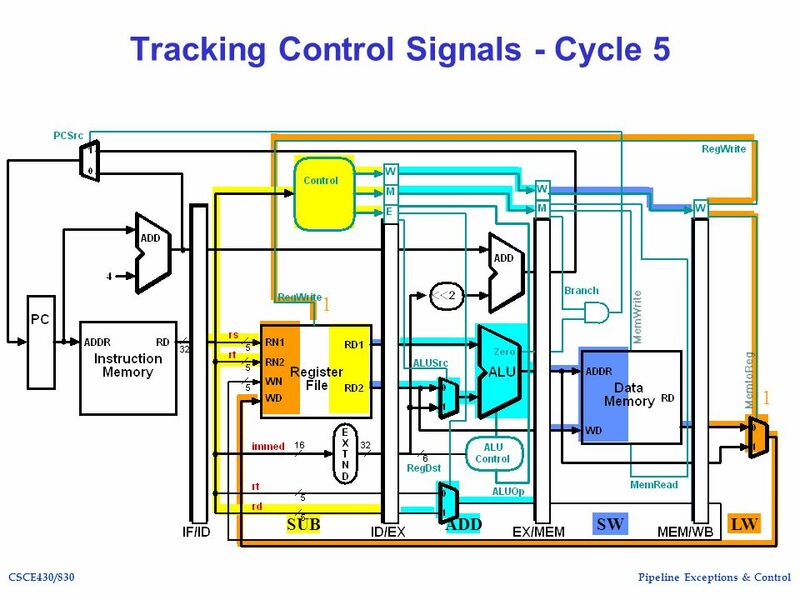 Chapter 5 The Processor: Datapath and Control Basic MIPS Architecture Homework 2 due October 28 th. Project Designs due October 28 th. Project Reports. 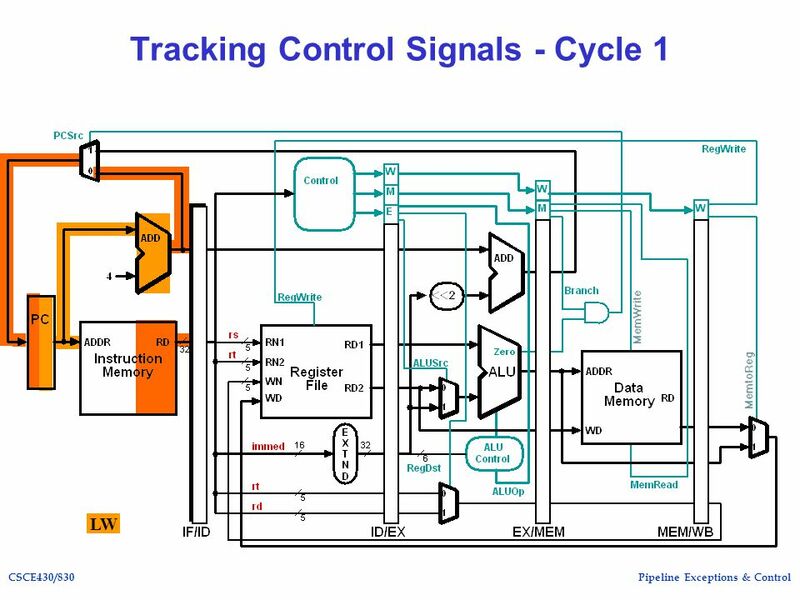 Prof. John Nestor ECE Department Lafayette College Easton, Pennsylvania ECE Computer Organization Lecture 18 - Pipelined. 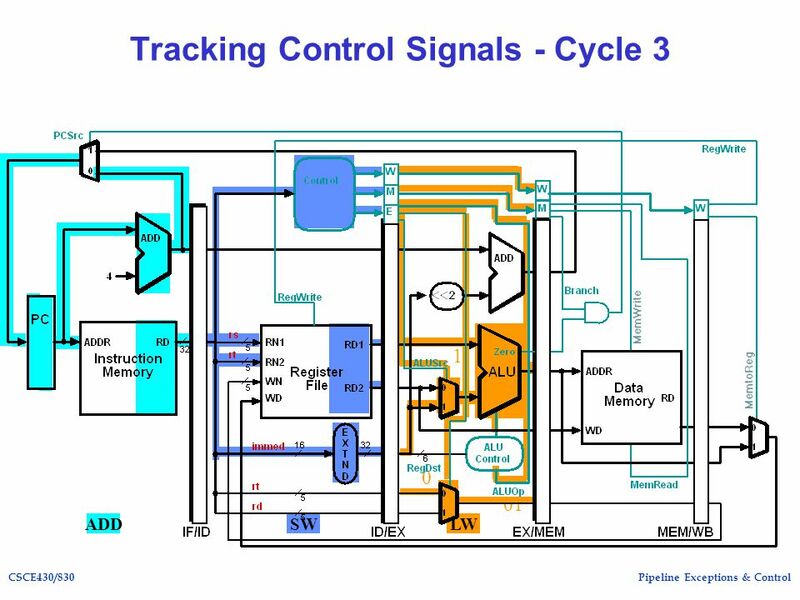 MIPS processor continued. 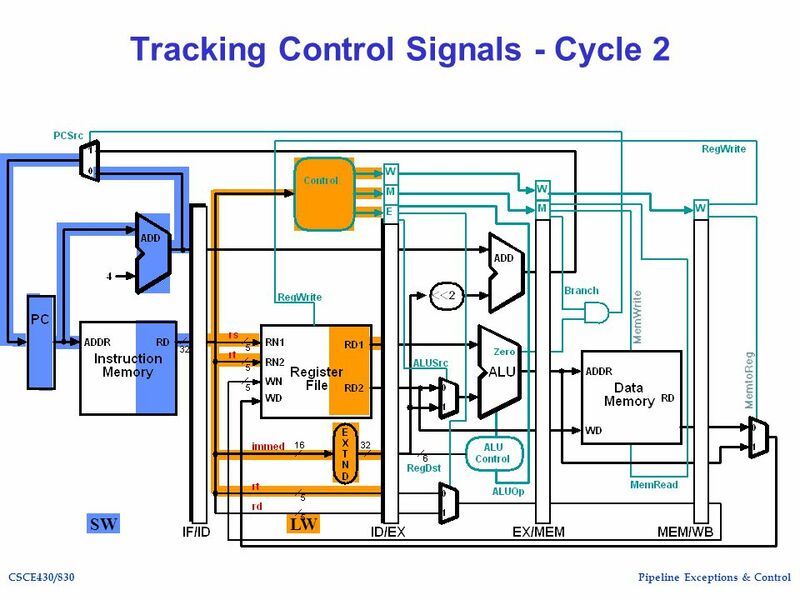 In Class Exercise Question Show the datapath of a processor that supports only R-type and jr reg instructions.